In a large soup pot or Dutch oven, cook the ground beef over medium heat, breaking apart with a wooden spoon, until cooked through. Drain the fat and return the meat to the pot. Stir in the red onion, green onion (white portion only), and green pepper along with a large pinch of salt and a few grinds of black pepper. Cook, stirring often, until the vegetables start to soften. Stir in the garlic through cinnamon and cook for another minute. Stir in the Worcestershire, tomatoes, beans, and butternut squash. Let the mixture come to a boil and then reduce to a simmer. Simmer for about 15-20 minutes, stirring occasionally, until the squash is tender. Stir in the chocolate until melted. Taste and adjust seasonings as needed (more salt, pepper, chili powder). Stir in the green portions of the green onion, reserving a few to garnish each bowl. Serve hot topped with sour cream, tortilla strips/corn chips, reserved green onions, etc. as desired. 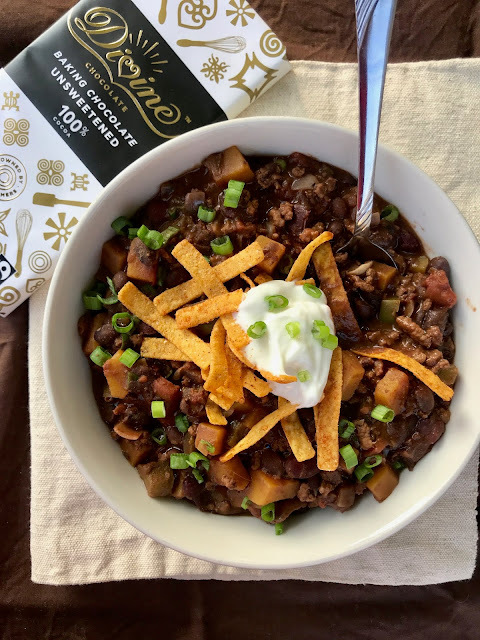 *I used a chipotle-based chili powder that has a bit of heat to it. Use your favorite brand and add less for a mild chili, or more for a hotter chili. You can always start with less and add more later when you are tasting. **I like the spices and touch of sweetness a little ketchup adds. 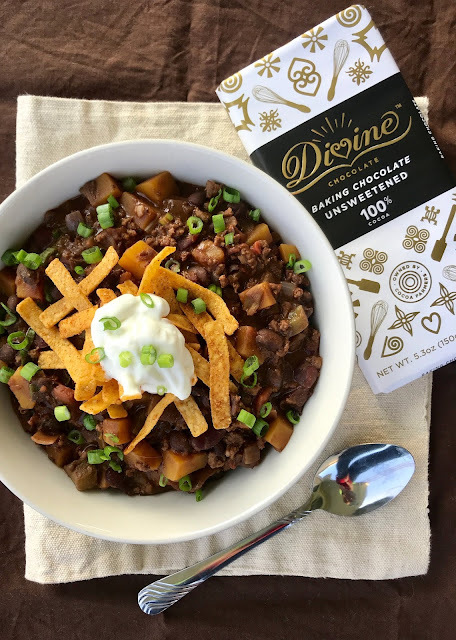 Love the idea of adding chocolate in the chili! This looks warming, comforting and amazingly delicious, Amy. 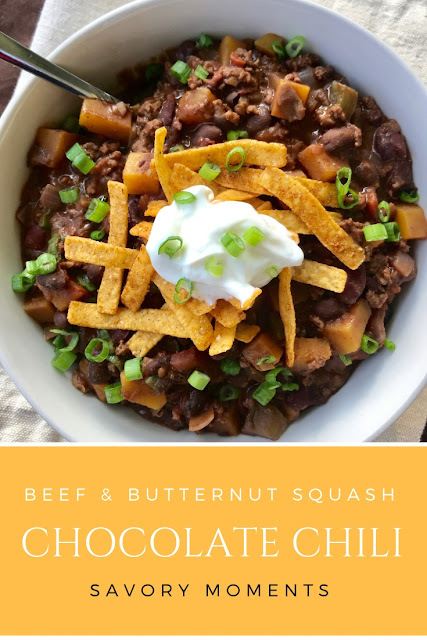 This chili looks delicious, Amy. What a terrific fall supper!! Thanks so much for linking this to First Monday Favorites. I love the addition of chocolate in a chili, it's amazing how much depth of flavor it adds without being sweet and chocolaty.